Custom Pet Memorial Stones provide a lasting memory of your loved pet companion. Pet loss is extremely difficult to go through. You may have lost a pet or know someone who has and have wondered what your options are to memorialize their life. Natural engraved stone pet memorials are a timeless and beautiful way to pay tribute to your faithful friend. Pet Memorial Stones make thoughtful gifts to friends and families that have lost a pet. Ordering a pet memorial from Stone Creations Northwest is easy, with hundreds of graphics and fonts to choose from there's lots to choose from. You are then able to add your own text to personalized your message. Stone engraving is our specialty and we are confident that you will find great comfort when you receive your custom Pet Memorial Stones. Memorial Stones are an excellent way to honor the ones you love so dearly. Engraved stone is timeless and beautiful. Personalized memorial stones can be featured in a memorial garden, surrounded by plants and flowers that were special to your loved one. They may also be placed indoors near an urn. Each engraved stone memorial is hand crafted with great care. We use 100% natural stone that is engraved deeply with great precision. We never use concrete or resin stone products. Stone engraving is truly a form of art where we pay close attention to detail with each and every one of our custom made Memorial Stones. We were recently featured in our local newspaper! The City of Estacada, located on the outskirts of Portland, Oregon is building a new park. We have done several stone engraving projects in the town before and were excited for the opportunity to create a beautiful stone sign for the entrance to the park. 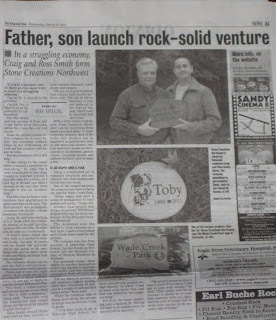 Jeff Spiegel of the Estacada News met with us for about an hour and wrote a wonderful article about us, and our company. He highlighted the stone engraving we did on the stone sign for the park and also on the engraving we did on the Estacada Veterans Memorial. 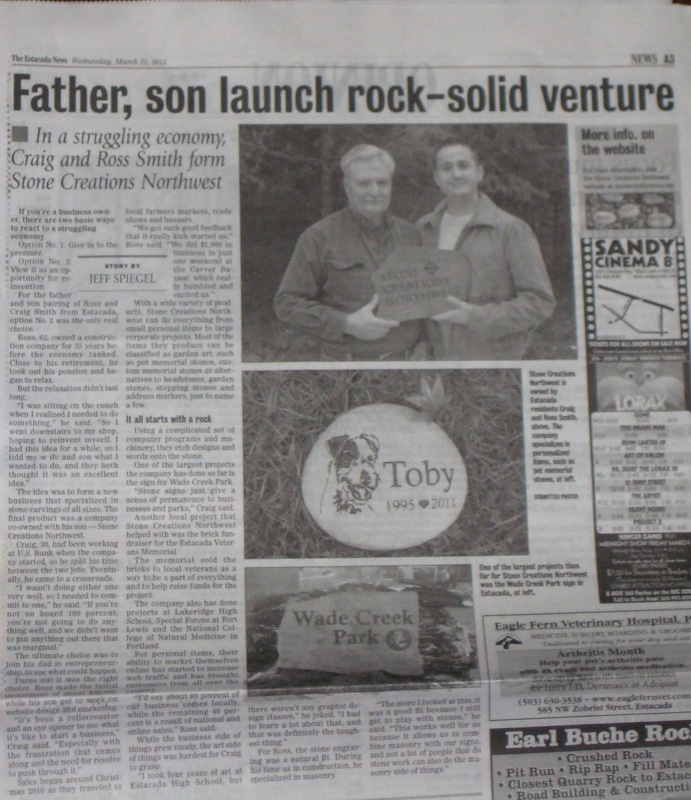 He also wrote about our other engraved stone products like our Memorial Stones, and Pet Memorial Stones. The City has some other big improvements and developments coming up in the future and we very much look forward to working with the city on their other needs for stone signs and stone engraving in the future.